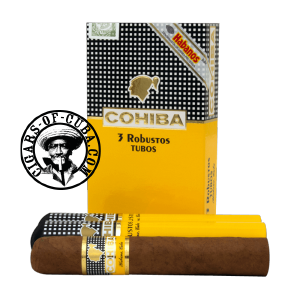 An ideal burn, combining balanced strength and flavor, which allows the complex blend to deliver rich grassy/beany aromas, so often associated with the Cohiba brand. Introduced in 1989 as part of the Linea Classica, the Robustos quickly became very popular and is now considered as one of Habanos S.A.'s leading cigars. On a technical level the construction is consistently perfect with a draw that is rich and ample. On the palate the intricate blend of fresh grass, bean aromas and rich earth take turns in leading the delicate bouquet. Now available in Tubos format! The first puffs leave a slight salty taste. Then, black honey notes marry into a gentle spiciness. It has an excellent draw. A delectable taste of black honey with hints of spiciness is dominant in the first third. In the second third, you can clearly feel cedary, woody notes developing. Whilst the smoke is smooth and creamy, the finale gets very powerful. Perfect end to a perfect Cuban cigar.